The Tulsi or Holy Basil is an important symbol in the Hindu religious tradition and is worshipped in the morning and evening by Hindus at large. 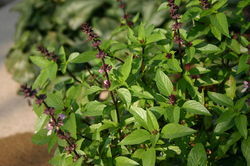 The holy basil is also a herbal remedy for a lot of common ailments. Here’re Some Medicinal Uses Of Tulsi. Owing to the years of industrial experience, we have been able to serve our valued clients with a wide range of Tukmariya Ocimum Basilicum. We are the prominent firm engaged in offering the best quality Ocimum Tenuiflorum Plant. AayurMed cultivates, sources, supplies and export herbs and spices for last 30 years across the globe. Our herbs and spices are used for various medical and cosmatics purpose. • Packaging : 20 kg. We have gained recognition as an eminent enterprise, devotedly engaged in offering premium quality Basil Herbs. - Basil has long been used in culinary traditions, but its history is rich with other uses in society. - In ancient Egypt, basil was likely used as an embalming and preserving herb as it has been found in tombs and mummies. 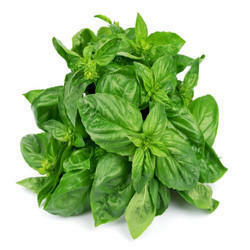 Spiso Basil has a sharply strong aroma and flavour and is widely used in Italian and Greek cuisine. It is wonderful with pasta, mushroom dishes, lamb, fish dishes, soups, salads and casseroles. Basil herb is diaphoteric, anti periodic, stimulating, expectorant and anti-catarrhal. It is used in malaria, catarrh, bronchitis and gastric disorders. It also lowers blood sugar levels and its powder is used for mouth ulcers. Ocimum Basilicum (Basil) is a multi-faceted seeds with many properties such as antiseptic, anti-depressant, antibacterial, diaphoretic, appetizer etc. The oil from the seeds has scientifically been proved for having anti-oxidant, anti-aging, anti-cancer, anti-viral and anti-microbial properties. The product can be procured in a good quality.